Do you have one special ancestor that you would give anything to know more about in your family history? I do, she is Nancy Mast Graf. 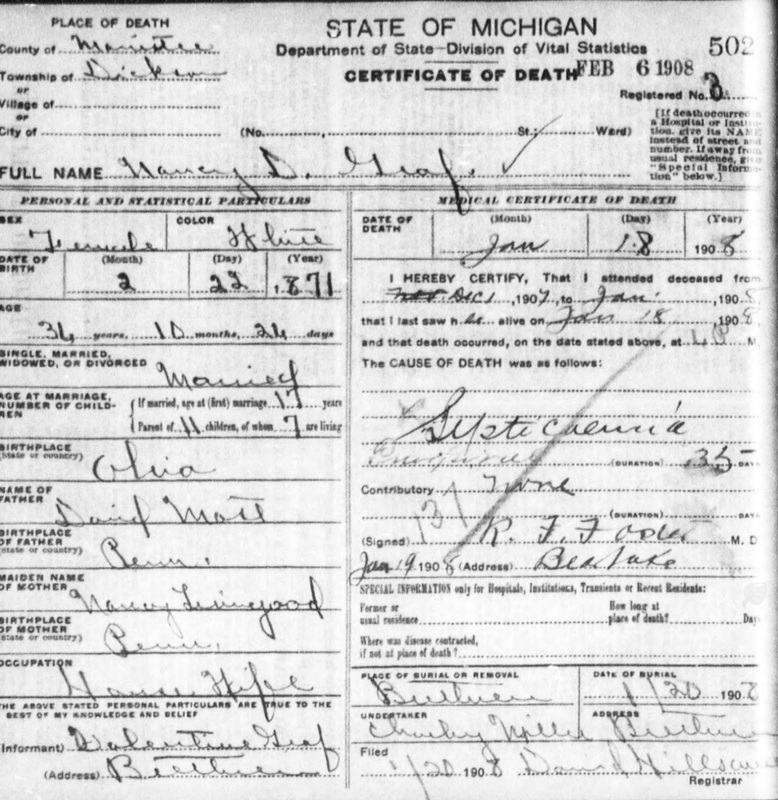 Nancy Mast Graf is my maternal, great grandmother and someone I have been very curious about since I started researching my family history. I wish I had asked my grandmother about her mother when I had a chance, but as a teenager I didn't think of those things. Now, I have to try and piece together her life and it has been hard. This will be the hardest ancestor biography I have written, but I wanted to give it a go and see where my gaps are. 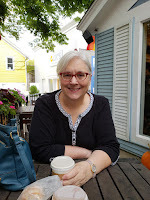 If you are reading this and have a connection to Nancy Mast Graf, I would love to hear from you. Please leave a comment or feel free to email me. Nancy D. Mast was the 14th of 17 children raised by David Samuel Mast and Anna Nancy Livengood. I say raised because David and Anna Nancy Mast raised two children, Alexander Saylor and Eli Frey, that weren't their own. Eli Frey is listed as adopted in the 1880 Census. Nancy Mast was born in Walnut Creek, Holmes, Ohio on 23 February 1871. The Mast family were members of the Amish Church and later, the Mennonite church. Sometime before the 1870's Nancy moved with her family to Walnut Creek, Holmes county, Ohio. Holmes County, Ohio is the oldest and largest Amish community in Ohio. Many of the early settlers of Holmes County came from Somerset County, Pennsylvania. I believe the family migrated to Holmes county with other Somerset county members of the Amish Mennonite faith. Nancy Mast can be found living in Walnut Creek Township, Holmes, Ohio in the 1880 United States Census. Other names on the page include Miller, Hershberger, Troyer, Schrock and Yoder. I have come across those surnames in my Somerset County, Pennsylvania research. Source: 1880 U.S. Census, population schedule, Walnut Creek Township, Holmes, Ohio, enumeration district (ED) 138, p130, family 72, David Mast Head of Household; digital images, ancestry.com (: accessed 11 October 2011); Original data: United States of America, Bureau of the Census. Tenth Census of the United States, 1880. Washington, D.C.: National Archives and Records Administration, 1880. T9, 1,454 rolls. During the 1880's Nancy's family moved again. This time to Indiana, possibly Miami county. It is in Miami County, Indiana where Nancy Mast married Valentine Graf on 24 November 1888, at the age of 17. (Source: "Indiana Marriage Collection 1800-1941." [Online database]. ancestry.com. www.ancestry.com : 2011.) 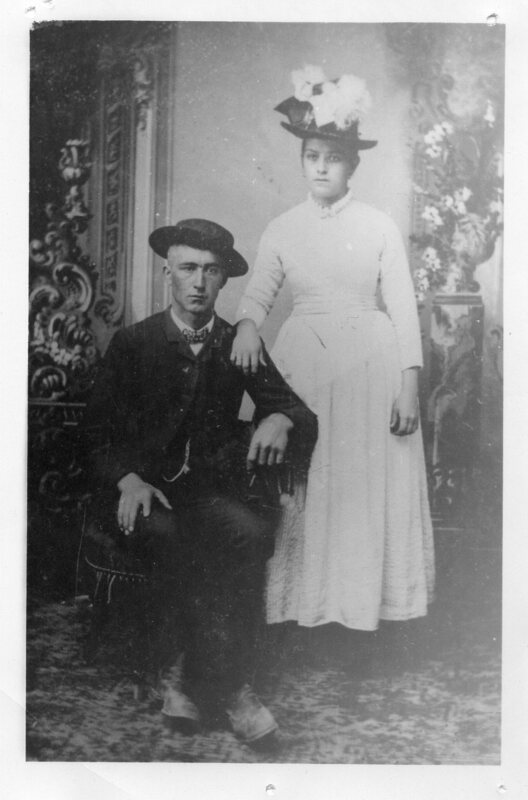 Nancy and Valentine eventually moved to Howard County, Indiana where some of their children were born near Plevna, Indiana. Valentine Graf and Nancy Mast on their wedding day, 1888. Thank you to Hannah, a Graf researcher, for sharing the above picture. Another move was in Nancy's future when Valentine and Nancy moved to Brethren, Manistee, Michigan around the turn of the twentieth century. An unconfirmed family story is that Valentine, Nancy and their six children, all under the age of 11, traveled by wagon train to Brethren, Michigan to help start the German Baptist Brethren Church, in Brethren. I know Valentine and Nancy were early members of this church. In 1907, when Nancy's last child was born, Nancy was 36 years old. Up to this age, Nancy had moved from Pennsylvania, to Ohio, to Indiana, (both Miami and Howard counties), to Michigan. She gave birth to ten children, two who died in infancy and one who lived a short nine months. Nancy's time in Brethren, Michigan could not have been easy. Shannon McRae in her Images of America Manistee County book tells of the early days of Brethren. The pine forests in the area had been forested and the land was useless. An agent, Samuel Thorpe, of the Michigan Land Association, wrote to members of the German Baptist Brethren church promising them "fertile soil and gentle climate". Some German Baptist Brethren chose to take Mr. Thorpe up on his offer. Valentine and Nancy Graf being among them, if the family stories are true. 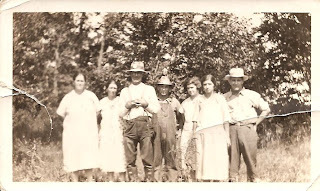 They arrived in Brethren and through a lot of hard work made the land into farm land that would sustain their family. Valentine and Nancy Graf's farm was on what is known today as Graf Rd, just west of the four corners in Brethren. Nancy would have been responsible for setting up a house while raising six children. I can only imagine that Nancy had an adventurous spirit and extreme faith in God to move that many times. Nancy Mast Graf died at the age of 36, on 18 January 1908. This was a few short weeks after the birth and death of her last child. The cause of death was septicemia, a blood infection. The word puerperal is written after septicemia on the death certificate. Puerperal fever use to be known as childbed fever. 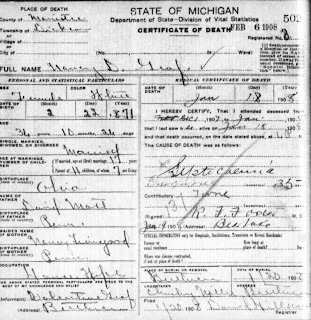 Source: State of Michigan, "Death Records 1897-1920," database, State of Michigan, Seeking Michigan (http://seekingmichigan.org/discover-collection?collection=p129401coll7: accessed 7 October 2009), Death Certificate for Nancy D. Graf #502; citing Michigan Department of State, Lansing, Vital Statistics Division. L-R: Daisy, Mary, Valentine, Henry, Nina, Margaret, Frank, date unknown. Nancy Mast Graf left her husband, Valentine Graf, to raise seven children ages 3-18. Valentine Graf never remarried. I have admired the strength of Valentine Graf to raise his children without his wife. Nancy Mast Graf is buried in Brethren Cemetery, Brethren, Michigan. Nancy lived a full life in her short 36 years. How sad about her death. Valentine was quite a man, to take over raising all the children, and I'm glad he lived a long life. Thanks, Barbara. Yes she did do a lot in her short life. Unfortunately, she died before anyone living today knew her. I have heard great things about Valentine.